Focus. Concentrate. Create. Are these goals for you, too? I find that cannabis, in general, helps me feel my body but the trick is finding the right ally for each of my activities. As an advanced user and an athlete, I find that a stellar cannabis product and proper dosing comes in clutch to help me achieve and have fun while doing it. Whether I’m carving into some fresh powder or looking to get a PR at the gym, a well-formulated sativa-leaning hybrid can give me the just-right combination of confidence and energy to get it done. Even more, I find that I “grind” less and enjoy myself more. Even if I’m sore, I’m happy and I know the cannabis is doing its thing to reduce inflammation so I can get back to it. I decided to put Plus Edibles Watermelon Sativa Gummies did to the test, as they seem on the surface to be an athlete’s homie. With a low-glycemic, gluten-free recipe (and Kosher to boot! ), I felt these were the perfect treat to slip into my backpack as I hit the snowy slopes with my board. Here’s the breakdown of how these Sativa Gummies performed. When I first received the product, it was in good condition with no harm to the edibles inside. This is in part because the actual gummies are hidden in a metal screw-top container (tin) which is enclosed in a child/almost adult proof plastic bag. The idea of placing the product in a tin is quite cool (to me); I feel like its more sophisticated than simply “bagging” them, but also not the most elegant packaging either. The packaging itself wasn’t “extraordinary” or very eye appealing, but rather simple and effective; there were different colors based on effects and a clear section to actually see the metal tin. It was also recyclable which is a nice touch as not many companies are using recyclable or environmentally friendly packaging due to new compliances and regulations. When looking at the packaging, there is a good yet modest amount of information; with new regulations and laws, companies are now “over-labeling” things on the packages that can sometimes confuse consumers. Plus does a good job of giving the consumer everything they would want to know minus 1-2 things such as farm (sourcing) information, and strains used for the edibles. They give you lab test results, batch information, company/brand information, and dosage instructions for new users. These bite-size gummies are perfectly cut up and divided for easy use. Knowing that each square is ~5mg with 20 squares in the package, it is easy for someone new to start with 1-2 pieces and wait for the effects while an advanced user might need to consume ¼ to ½ of the container to get any effects. Plus gummies are portable, small and convenient for almost any situation. The discreet packaging allows for resealing to ensure freshness and portability. These little squares are perfect for any occasion due to how much they look like normal candy/gummies. Rather than having your usual brownie or cookie, these small artisanal candies could be consumed anywhere: the beach, the movies, at work, at home, kids’ soccer games… virtually anywhere. When you first open the container and smell the gummies, it reminded me of those watermelon belts that I would eat as a kid: sweet and pungent and yummy! Upon actually trying them, I was delightfully surprised to taste a briefly sour then deliciously sweet watermelon taste, similar to biting into a nice rind on a summer day. Unlike your firecrackers and brownies of days past, the cannabis taste is completely hidden and masked by the taste of other great ingredients. Even without being infused with cannabis, I would honestly buy them as they are an exemplary gummy on their own. When you first pick up and touch the gummies, you feel a grainy/coated candy that is soft and chewy. Depending on which Plus flavor you try, the coating is either more sugary or sour and more coarse – nothing that is gross or undesirable, just the nature of the candy. Some of the Uplift Watermelon gummies did have more chewiness to them which was weird at first, but after trying the rest I was reassured that it was just 2-3 in the container. Overall, they were easy to eat and what I look for in a gummy edible. When trying cannabis edibles or any products, the results are going to very for everyone; while one may try an uplifting gummy and feel more calm/sedated, someone else might feel energetic and creative. I decided to give these Uplift gummies a try before a rigorous day of snowboarding – boy did they come through. Rather than giving my body a numbing feeling and making the day a struggle, I was able to charge down the mountain and ride all day with energy flowing through my body. Being a more advanced cannabis user, I decided to try 5 of these gummies for a total of ~25mg. This was a good testing dose as I felt the energy and “trick creativity” I needed while snowboarding without the anxiety that could have crippled my riding. When consuming edibles, the biggest factor for me is consistency in the dosages. Everyone has that horror story of the time their friend gave them a brownie with and said its 50mg and it turned out to be 1000mg…it wasnt pleasant. Now with the requirement of lab testing, the error of inconsistency has been reduced but can still be an issue. When trying these Plus watermelon edibles, I was happily surprised that the effects were as listed and the dosages felt right: 25mg felt about right and when I tried 50-70mg later on, there was definitely different effects. There was maybe one or two gummies that I ate for fun that felt underdosed or my tolerance was too high, but in general, Plus shows consistency in bringing you the same quality dosage every time. Two-fold packaging: a stylish bag which contains a tin that houses 20 gummies. We recommend being sober(ish) when you attempt to open these, as they are definitely tamperproof and child-resistant (nearly adult resistant, too). Plus includes all the important stuff without overloading you with info. A confident display. Edibles are easy to scale up or down, depending on your experience. New to cannabis? Start with one and see how you feel. Seasoned user? Start with four or even five, and go from there. Tin slips readily into your pocket for whatever adventure you’re cooking up. Gummies resemble other gummies out there and don’t reek of reefer, so they’re friendly for consumption in any environment. Anyone who loved Fruit by the Foot as a kid or sour watermelon belts is going to flip for this flavor of gummies. Delicious watermelon flavor with no trace of cannabis. Coated with sugar and not overly chewy. Might be a few pieces that you have to chomp down, but overall a mouthwatering sweet and sour candy. With edibles, there’s always some variability depending on mood and body chemistry that day. These gave me the creative, energetic boost I was after. Other than incorporating into another dessert concoction or possibly a beverage, you’ve pretty much just got a classic gummy here. Aside from one or two “underwhelmers,” Plus’ Uplift gummies delivered their intended effect when I consumed in consistent doses. At around $17 for 20 gummies, you’re getting a really good deal. Having tried numerous edibles and gummies over my years as a medical marijuana patient, I must say that Plus has a great thing going here. With different flavors and effects for different situations, it would be hard not to find one you like. Uplift is true to its name and definitely got me feeling good and ready to tackle the technical aspects of the mountain. With amazing pleasure, taste and potency, Plus Edibles Uplift Watermelon Sativa Gummies is a fine bargain. 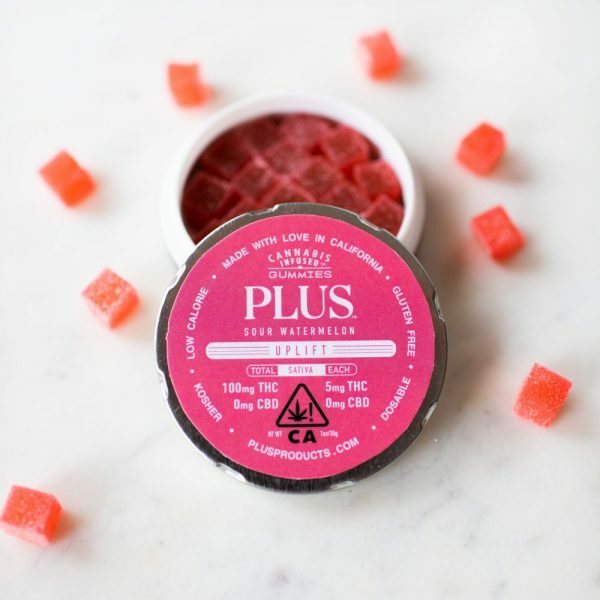 If you live in the Los Angeles area and are ready to try these mouthwatering watermelon sativa gummies from Plus Products, click here to see if Nugg Club delivers to your address!